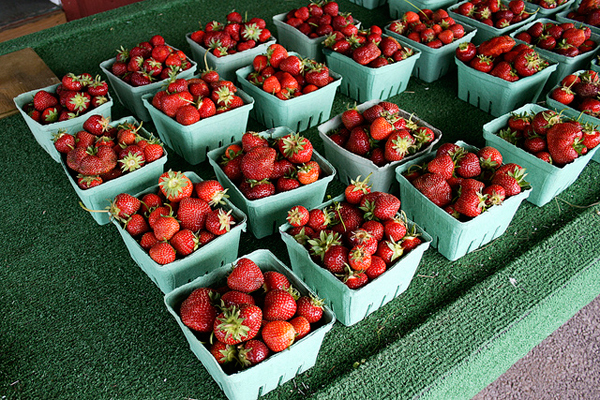 Local strawberries on display at market. 1. Become a Friends & Farmers Coop member, and help them as they work toward two important goals: 1) Reaching 800 owner-members to be able to sign a lease agreement for a location, and having 1,300 owner-members by the time the doors open for business. You can help them reach their goals by joining. 2. Incorporate more local food into your healthy new resolution diet. There are plenty of sources for local food now in our area, with more appearing every day. Since fresh produce tastes better, you won’t be sacrificing flavor. 3. Try out a new farmers market. We have a wide variety of farmers markets here in Centre County, several in the Altoona area, and others scattered across central Pennsylvania. A quick Google search can help you find new farmers markets, and likely some new food finds. 4. Talk to a farmer. Find out more about where your food is coming from, how it’s grown, what is used for pest control, fertilizer, etc. One of the biggest advantages to farmer markets is direct contact with people who provide your food…so take advantage! 5. Go to a restaurant that serves local food. We have a growing number of local food restaurants here in our area, from pioneers in serving food made with local ingredients, such as Harrison’s Wine Grill, to relative newcomers like Revival Kitchen. 6. Keep up on local food issues and support local food providers if/when something comes up that threatens them in some way. You never know what is coming down the pike, and when they might need help for their very survival. 7. Grow something! If you have a yard, plan a garden. If you don’t, there are options like getting a community garden plot, or even growing herbs on a sunny windowsill. Nothing beats the taste of something you grew yourself. 8. Sign up for a CSA. We have multiple options here in Centre County, such as Tait Farms, Village Acre Farms, Groundwork Farms, and more. Do a Google search on your home area and CSA, or ask your friends. 9. Try a new vegetable. Ever wonder how those weird kohlrabi things you see at farmers markets taste? Find out! You can open yourself up to new flavors or even a new favorite food. 10. Get a friend interested in local food. If you know someone who is sort of reluctant to try a farmers market or a local-source restaurant for whatever reason, change their mind! Take them to lunch, or buy them a local food gift. We can never have too many people in the local food community.